The Trafalgar St. James London, Curio Collection by Hilton, located in the heart of Trafalgar Square, is a sanctuary of style, rest, and play in the bustle of St. James. It was once home to the Cunard Steamship Company in the late 18th century to the early 19th century who eventually merged with the White Star Line, owners of the ill-fated RMS Titanic. Opened in 2000 as the Trafalgar Hotel, it became Hilton’s first Curio Collection by Hilton hotel in the U.K. in 2017. After the Hilton acquisition, a massive renovation of the hotel was done. The rooms contain Art Deco elements, original art, books, and bespoke carpets in over 131 guestrooms, including three suites. The hotel also has three different places to dine, featuring Mediterranean fare and local favorites. Those looking to hold a meeting or wedding will be pleased to find the modern Trafalgar St. James is the premier London location that can accommodate up to 200 guests. Locally, guests can expect to be wowed by the many storied sights and landmarks so close to the hotel. Buckingham Palace, Westminster Abbey, Big Ben, the London Eye, and the Houses of Parliament are all within a half mile. The National Gallery is less than one kilometer away. Guests can take tours of the area, visit a putting green, go for a jog or stroll, or hike in nearby parks. There is a driving range, a video arcade, and basketball carts available nearby as well. Enjoy London while staying at The Trafalgar St. James London, Curio Collection by Hilton. 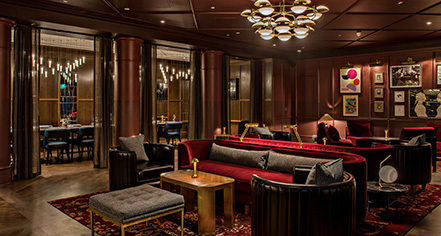 The Trafalgar St. James London, Curio Collection by Hilton, a member of Historic Hotels Worldwide since 2018, dates back to the 18th Century. The boardroom of The Trafalgar Hotel St. James London was featured in the classic British spy films Dr. No (1962) and The Ipcress File (1965). Early Check-In/Late Check-Out: Fees vary. The Trafalgar St. James London, Curio Collection by Hilton, located in the heart of Trafalgar Square, is a sanctuary of style, rest, and play in the bustle of St. James. 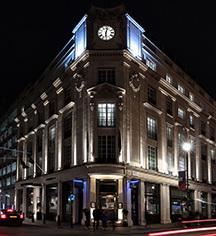 Learn more about the History of The Trafalgar St. James London, Curio Collection by Hilton .